Alright pumpkin lovers, it’s officially the first fall post of the year! Although fall is my favorite time of year, I have held out on all the autumn-themed recipes because it is still 80 plus degrees outside in my neck of the woods. Last year I promised myself never to complain about the heat because the cold winter air, chapped lips, cracked elbows seemed to last forever. I am happy to report that I have fully embraced summer this year and am holding on to it for dear life! Having said that, it is time to prepare for cooler days and pumpkin-freakin-everything. I eat yogurt almost every morning for breakfast because it’s something that both my one year old son and I can eat. With the exception of snacks and quick bites, my rule of thumb for feeding him is, as long as he can chew it, he eats what we eat. With that philosophy in mind, I do my best to prepare fresh food that can be made in a snap with little-to-no refined sugar added. Fresh spices are a great way to open up your child’s palate to a whole new way of eating. Pumpkin and yogurt are the perfect vessels for flavorful additions! First, start with unsweetened plain yogurt (I used organic greek yogurt because of it’s high protein content) and add pure canned pumpkin, maple syrup, cinnamon, cloves, ginger, and cardamon. Yogurt…Done! Make this yogurt the night before or gobble it up immediately. “You want to get nuts, come on, let’s get nuts!! !” Bonus points if you can figure out what actor and movie that’s from:) Ok back to the pecans… Those dang pecans!!! I could have eaten an entire bucket of these and not thought twice about it. These are the easiest snacks to make. I coated them in coconut oil, a pinch of the same spice blend I put in the yogurt, and a touch of salt. They baked at 325 degrees for 5-7 minutes or until they were fragrant and slightly toasted. The window between perfectly toasted and burnt is a very small one, so check after five minutes and taste them! 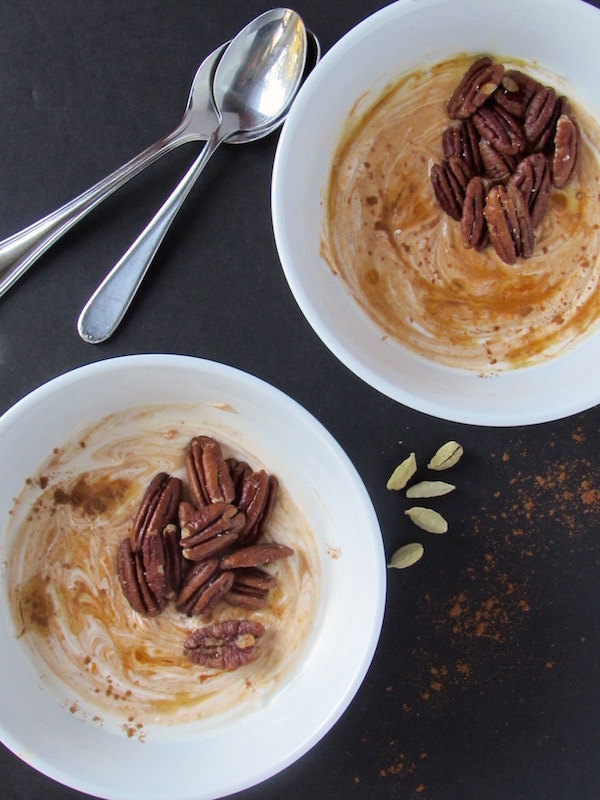 Pumpkin chai yogurt is a perfect autumn breakfast with spiced roasted pecans. 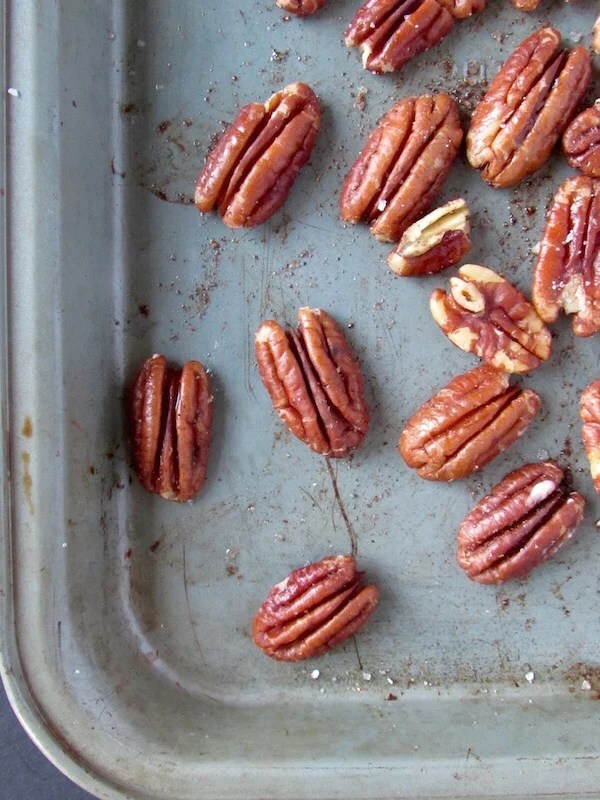 Coat the pecans in coconut oil. The warmth from your hands will melt the oil. Mix all the spices together and add a couple of pinches to the pecans along with a pinch of salt. 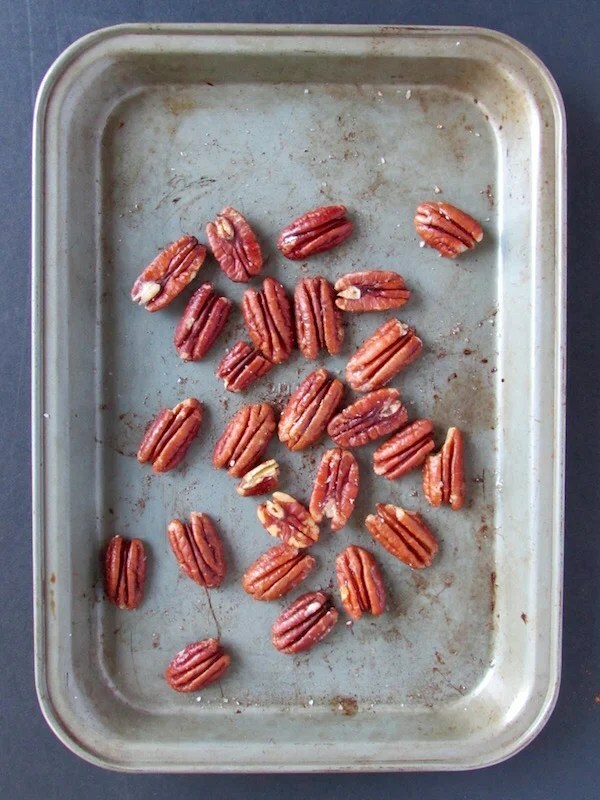 Bake the pecans for 5-7 minutes or until just fragrant. Taste one after five minutes, they burn very quickly! Mix the yogurt, pumpkin, remaining spices, and maple syrup together. 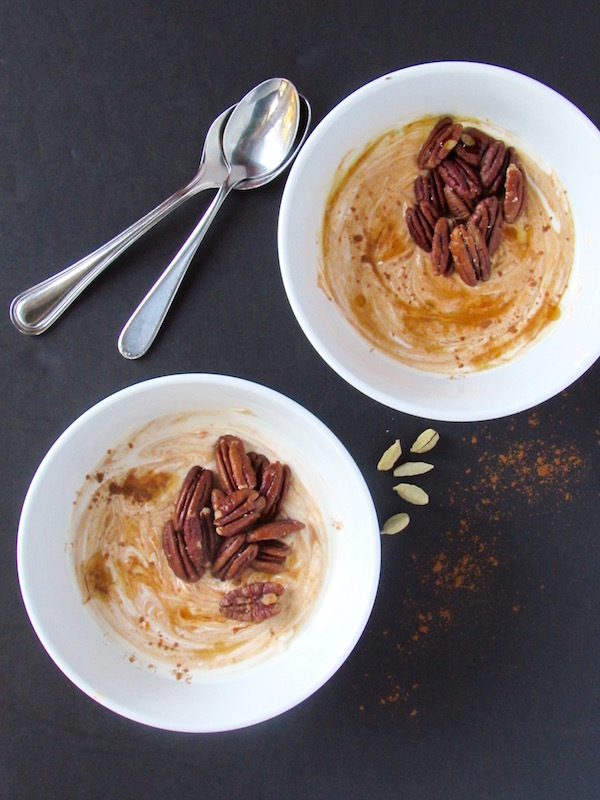 Divide amongst two bowls and top with roasted pecans. amazing recipe and beautiful pictures!! Your blog is so very beautiful and I love this recipe because chai is one of my favorite Indian spice mixes. I know that it would go perfect with pumpkin. Pumpkin? Chai? The epitome of Fall flavors. Yummo! Pumpkin chai? This yoghurt is bursting with fall flavors and I love it! Well, I would eat yogurt like this 10 times a day and by the way you should mail big company about this flavor combo since it sounds amazing! Wow thanks for the comment! I am so new to the food blog world I would have no idea how to even go about contacting companies for recipe development. You really have a great idea! This looks so YUM, homegirl! I’m drinking a chai wishing I was eating that! MMMMM chai tea, my absolute favorite, and definitely the inspiration for this yogurt! Pumpkin and chai, with yogurt? Clearly a fall winner here! Great job. Yummy!! This would be perfect at any time. I can see me eating this for dessert! I think it would be a great dessert, with much fewer calories too! What a fabulous breakfast and way to start the day! Thanks for sharing! I love everything about this recipe. perfect ! 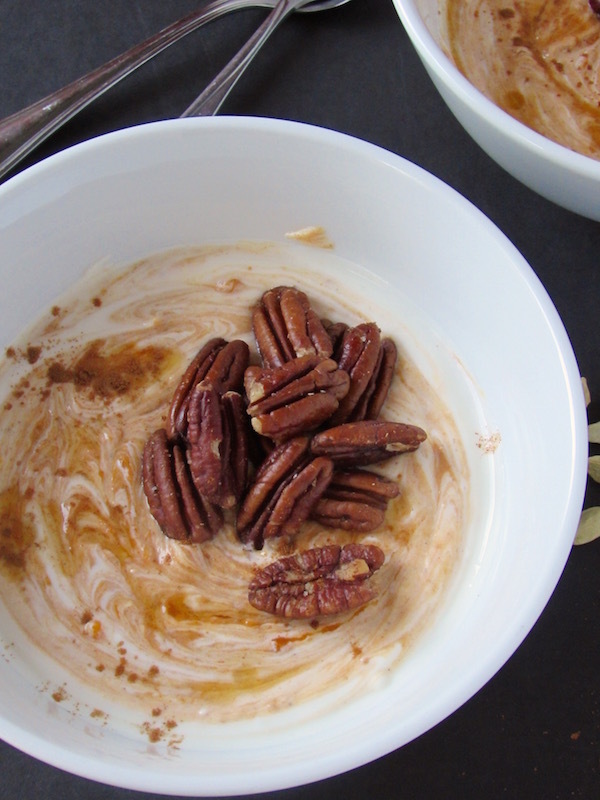 Such wonderful flavors and the pecans over yogurt looks fantastic. What a neat yogurt! I love the addition of the roasted pecans! What a perfect pairing .. pumpkin and chai!! I cant wait to try this!